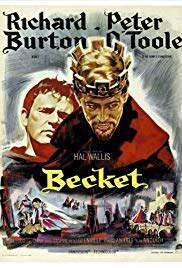 Becket is a 1964 Anglo-American dramatic film adaptation of the play Becket or the Honour of God by Jean Anouilh made by Hal Wallis Productions and released by Paramount Pictures. It was directed by Peter Glenville and produced by Hal B. Wallis with Joseph H. Hazen as executive producer. The screenplay was written by Edward Anhalt based on Anouilh’s play. The music score was by Laurence Rosenthal, the cinematography by Geoffrey Unsworth and the editing by Anne V. Coates.